Or a current user of Jira but looking to learn more advanced ideas and concepts in configuration, integrations, and marketplace apps, this event is perfect for you! Jimmy is an Atlassian Expert that specialises in Jira Service Desk and Confluence. Today, Jimmy is heading up GLiNTECH's Atlassian for Business initiative that aims to help clients leverage Atlassian products with packaged and automated solutions that solve common business problems. Kate is a Certified Senior Atlassian Consultant who specialises in ITSM and Agile Solutions. Kate has been instrumental in designing solutions to solve business problems in ITSM, ITIL, Agile, Scrum and DevOps environments and teams. Kate specialises in providing best practice solutions, improving efficiencies and business processes. Jeremy is a Senior Consultant at GLiNTECH. 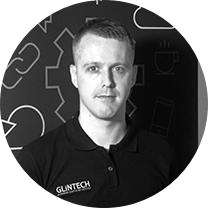 With over 10 years experience as a developer, Jeremy specialises in helping customers optimise and streamline their delivery practices.